Raisin, sugar, cocoa BUTTER, MILK, lactose, WHEY, yogurt flavoring, thickener: E414, glucose syrup, vegetable oil, emulsifier: E322, flavor, glazing agent: E904, citric acid, preservatives: E200. May contain traces of PEANUTS and NUTS. We always felt pity for those small and innocent raisins - alone and unprotected as they are. We are relieved to announce, that they finally found their perfect protection: white chocolate with a hint of yoghurt and vanilla. Every colour has its meaning, every colour has another impact on humans. Some say, white is the sum of all colours and therefore has a clearing and resolving impact on people. So, while looking at those lovely raisins, it becomes clear to us, that we have to eat them. Quickly. It is advisable, most of the time, that you may eat your meals at a table. Otherwise, your ideal of hygiene and cleanliness cannot be kept up. 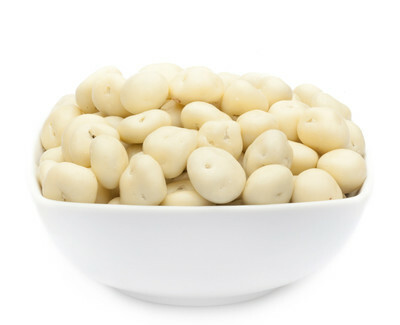 Worst-hit are people living in snowy areas: if you lose those juicy Choco Yoghurt Raisins, they are lost forever. We advise you to put them into your cereals or in your mouth, instead.